This is not a knock on the original, iconic Doom box art, gorgeously illustrated by the late great Don Ivan Punchatz. This is just a tribute. But some may consider it a "fix" of artwork that grace id's early '90s shooter. This is the work of "Agent Scarlet", an artist we've featured more than once on Kotaku. It does service to the classic Doom cover by actually populating it with the hellspawn we've come to know and fear over the past decades. 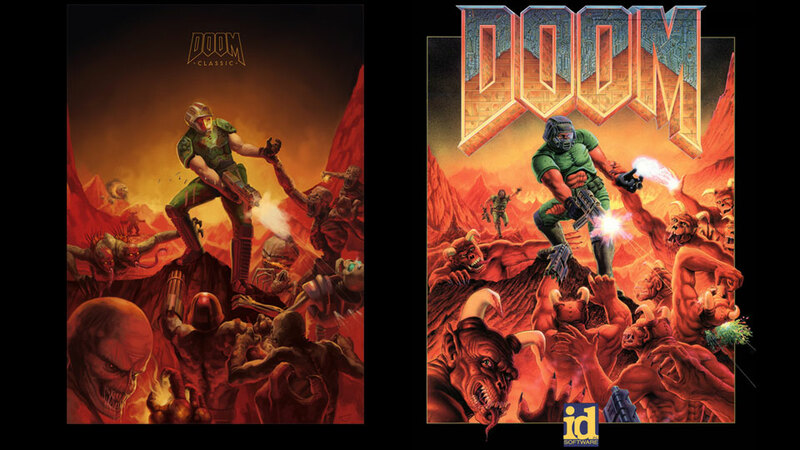 It also extracts some of the creative licence Punchatz took with Doom's simple graphics, taking some of the Mega Man-like qualities out of its box art. See it in full below or head to Agent Scarlet's deviantArt account for the big picture. Is that an ally in the background of the original pic? I never noticed that. Though now that I think about it I do have vague memories that if you played on ultraviolence without cheats and you did well enough, or fast enough, you could get an AI on your side for a short period of time to help you. I'm pretty sure that's a Cyber Demon bro. I like the original art better! Another vote for the original. I think the new one 'looks' better, but feels sterile compared to the original. He looks like he is casually standing on a rock, and the whole thing is a bit clean and lacking dynamics. Way way way better than anything I could do, and a great picture, but could do with a bit more urgency in the lines. The old one has better contrast, I like that the artist added in the actual enemies from the game but the guy shooting just doesn't look right to me. He should be pulling away more from the creature grabbing his arm and his feet need better footing.. He just looks awkward and his feet aren't firmly planted on that rock. But for the most part I love it. meh, sorry, seems incoherent, like done by someone who didn't get it.